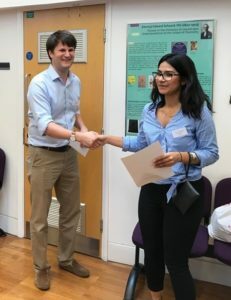 Dr Guillaume De Bo (left) presenting the Chem Soc Rev prize to Aisha Bismillah (right). 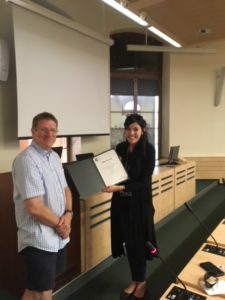 The 2nd Early Career Researchers Meeting of the RSC-Macrocyclic and Supramolecular Chemistry (RSC-MASC) Group took place on 27th July 2018 at the University of Manchester, UK. This one-day symposium was organised by Dr. Guillaume De Bo (University of Manchester) and was attended by PhD students and post-doctoral researchers within the supramolecular field. The meeting consisted of fifteen selected talks from submitted abstracts, and all attendees were invited to present a poster. The day ended with a plenary lecture by Professor Anthony Davis (University of Bristol) on ‘Biomimetic Carbohydrate Recognition: The Host-Guest Chemistry of Carbohydrates in Water’. Chem Soc Rev was proud to sponsor this successful symposium. Aisha Bismillah (Durham University) was awarded the Chem Soc Rev oral presentation prize for her talk on ‘Shape-Selective Crystallisation of Fluxional Carbon Cages’. 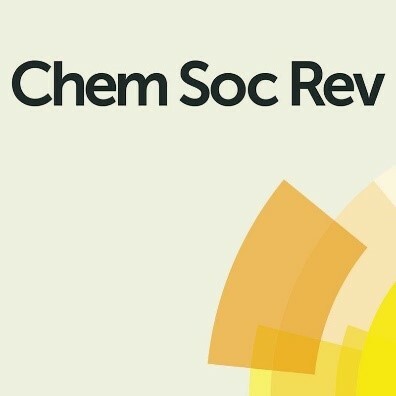 Congratulations Aisha from everyone at Chem Soc Rev! We are delighted to announce that Dr Rafal Klajn, winner of the 2017 Chem Soc Rev Emerging Investigator Lectureship, will be giving a series of lectures at UK universities during the week commencing 16th July 2018. 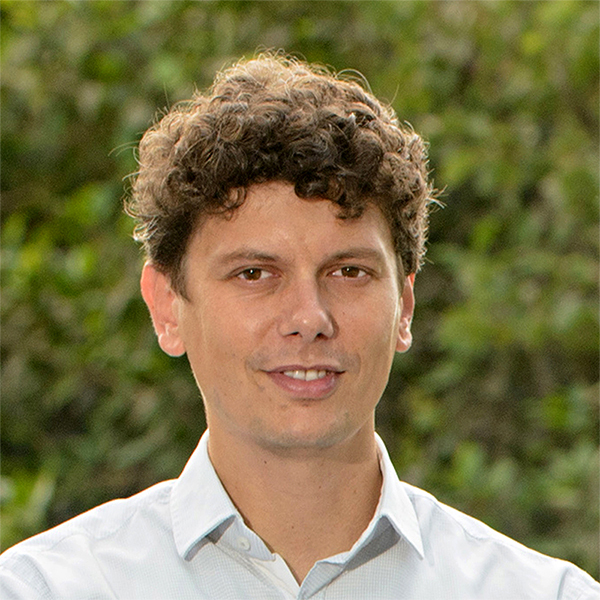 Rafal began his independent research career in November 2009 at the Weizmann Insitute of Science, Israel, directly after obtaining his PhD degree. His group has worked on nanoscale reactivity and self-assembly – incorporating photo-responsive moieties into nanoporous solids, working with superparamagnetic nanoparticles of various shapes and demonstrating that cubic nanoparticles of iron oxide could spontaneously assemble into helical materials, and developing the concept of “dynamically self-assembling nanoflasks” capable of accelerating chemical reactions using light, working with flexible metal-organic (coordination) cages that can encapsulate diverse organic molecules ranging from fluorescent dyes to nonpolar pharmaceuticals, among other projects. He is currently an Associate Professor at Department of Organic Chemistry at the Weizmann Institute of Science and now focuses on creating synthetic out-of-equilibrium systems and “life-like” materials, not only to develop innovative functional materials, but also to tackle what he deems as one of the most important and fascinating problems – the origin of life. As part of the Lectureship, Rafal presents 3 lectures and we are delighted to announce that these will be taking place during his UK tour. He will be giving these in conjunction with lectures for the ChemComm sponsored 2018 Cram Lehn Pedersen Prize that was also awarded to him. You can find details for his upcoming UK tour below. The European Federation of Catalysis Societies (EFCATS) School on Catalysis was held 25 – 29 June 2018 at Castle Liblice in the Czech Republic. The motivation behind the conference is ‘where experiment and theory meet in catalysis’. This year’s program included tutorial and plenary lectures from international experts in the field, including Professor Gabriele Centi (University of Messina), Emiel Hensen (Eindhoven University of Technology), Bert Sels (KU Leuven) and many more. The talks covered a wide range of topics such as industrial catalysis, two-dimensional materials, molecular sieves and petrochemistry. 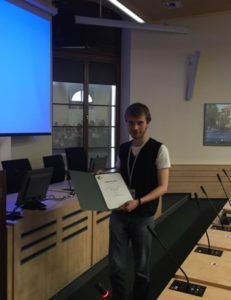 We’re delighted to announce that the Chem Soc Rev poster prize was awarded to Nicolas Sadovnik and the Chem Soc Rev oral presentation prize was awarded to Chelsea L. Tucker. Well done Nicolas and Chelsea (pictured below), from everyone at Chem Soc Rev! On behalf of the Chem Soc Rev Editorial Board, we are pleased to announce the winner of the 2018 Chem Soc Rev Pioneering Investigator Lectureship – Rubén Martín. 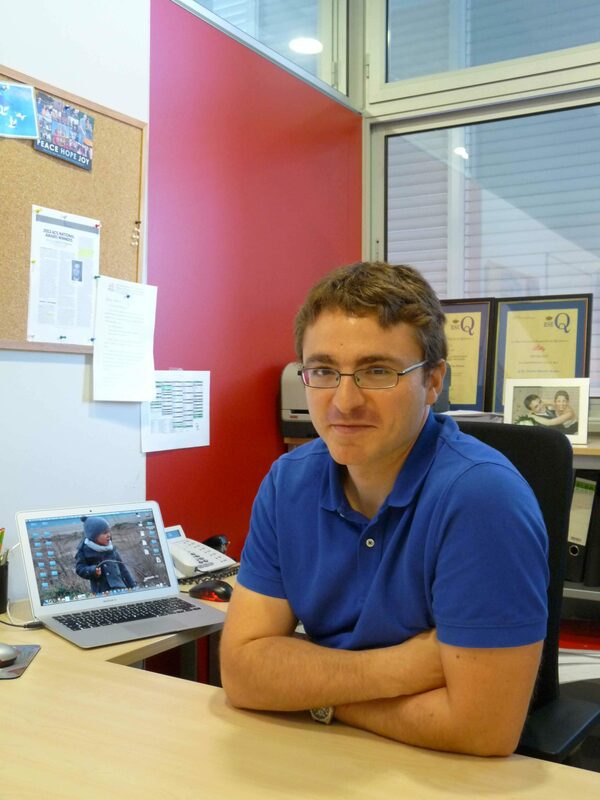 Our warmest congratulations to Rubén for being selected as the very first Chem Soc Rev Pioneering Investigator! Rubén was born in Barcelona. He was awarded his PhD in 2003 at Universitat de Barcelona, where he worked with Professor Anotoni Riera on the total synthesis of glycosidase inhibitors. During his independent career, he has received the 2010 RSEQ Young Investigator Award, the 2011 Thieme Chemistry Journal Award, the Eli Lilly Young Research Investigator Award, the 2017 Marcial Menno Lectureship Award and the 2017 OMCOS Award. He began his independent career at the Max-Planck-Institut für Kohlenforschung, where he worked with Prof Alois Fürstner on the application of novel iron catalysts for cross-coupling and Alder-ene type reactions. He then moved to the Massachusetts Institute of Technology where he worked with Prof Stephen L. Buchwald and developed new synthetic strategies for metal-catalyzed C-C and C-N bond-forming reactions. In 2008, he joined the Institut Català d’Investigació Química (ICIQ) as a group leader, and in 2013 he was promoted to Associate Professor. He is currently an ICREA Research Professor at the ICIQ and his group’s research interests focus on the discovery and development of synthetically useful organometallic methodologies. As part of the Lectureship, Rubén will present a lecture at three locations over the coming year, with at least one of these events taking place at an international conference, where he will be formally presented with his Pioneering Investigator Lectureship certificate. Details of his lectures will be announced in due course – keep an eye on the blog for details. Chem Soc Rev Pioneering Investigator Lectureship 2018 – nominations now open! We are pleased to welcome nominations for the 2018 Pioneering Investigator Lectureship for Chem Soc Rev. All nominations must be received by Monday, 19 February 2018. The Pioneering Investigator Lectureship replaces our previous Emerging Investigator Lectureship, and aims to recognise mid-career scientists who have firmly established themselves in their independent careers. Early career researchers can be nominated for the ChemComm Emerging Investigator Lectureship. • Recognises mid-career scientists who have firmly established themselves in their independent careers, continuously publish innovative work, and have pioneered several research areas. • Eligible nominees should have completed their PhD between 15th September 2002 and 14th September 2009. • The recipient of the lectureship will be invited to present a lecture at three different locations over a 12-month period, with at least one of these events taking place at an international conference. • The recipient will receive a contribution of £1500 towards travel and accommodation costs for their lectures, as well as a certificate. • The recipient will be asked to contribute a review article for the journal. Self-nomination is not permitted. Nominators must send the following to the editorial team via chemsocrev-rsc@rsc.org by Monday, 19 February 2018. • Recommendation letter, including the name, contact details and website URL of the nominee. • A one-page CV for the nominee, including a summary of their education, dates of key career achievements, a list of up to five of their top independent publications, total numbers of publications and patents, and other indicators of esteem, together with evidence of career independence. • A copy of the candidate’s best publication to date (as judged by the nominator). • Two supporting letters of recommendation from two independent referees. These should not be someone from the same institution or the candidate’s post doc or PhD supervisor. The nominator and independent referees should comment on the candidate’s presenting skills. Incomplete nominations or those not adhering to the above requirements will not be considered, and nominees will not be contacted regarding any missing or incorrect documents. • The editorial team will screen each nomination for eligibility and draw up a shortlist of candidates based on the nomination documents provided. • Shortlisted candidates will be asked to provide a brief supporting statement summarising their key achievements, highlighting the impact of their work and justifying why they deserve the specific lectureship for which they have been entered. • The recipient of the lectureship will then be selected and endorsed by a selection panel composed of members of the ChemSocRev Editorial Board. The winner will be announced in the first half of 2018. NB: Please note that members of the selection panel from the Chem Soc Rev Editorial Board are not eligible to nominate, or provide references, for this lectureship. For any queries, please contact the editorial team at chemsocrev-rsc@rsc.org.